I painted large paintings only lately so it was time for a miniature art painting aka ACEO ; you know, those little 2.5×3.5 inches art cards; just to avoid losing the skill. 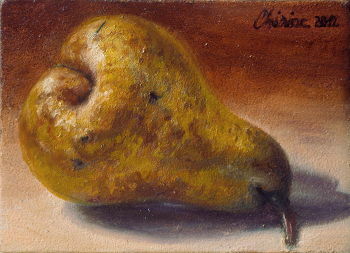 Because I like painting pears, I made an ACEO oil painting of a pear, a realist one as usual. From all the fruit of autumn, the most I like are pears! Now this is not only about artwork that got pears on it but to eat pears, too :). I so love their soft juicy texture and their taste : some sourish-sweet, some sweetest sweet. So this is no surprise that pears are very present on my artwork. As about this particularly pear from this ACEO still life painting, you can see that it’s a kind of fruit but ordinary pear. If it is to paint a still life of fruit or something, then I chose a little different from the standard fruit yet not so different. Just enough to stand out of the crowd. Well, to paint such a fruit and people still recognize what kind the fruit is, I have to paint it as realist as I can. So, I’ve choose for this miniature still life oil painting, a pear that have a some kind of a swirl at the bottom as you can see in the second picture where’s the ACEO and the real pear side by side. I hope I was able to depict this pear quite realist in the small space of an ACEO miniature painting. A tiny still life miniature oil painting of an unusual pear. Check my “Paintings for sale” page to see if it’s still available for sale.